Living legends in perfect synchronicity - Two giants of rock and a staggering shared catalogue all add up to a stellar concert for Brisbane fans. It was a concert of old friends and old fans. 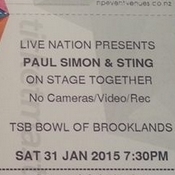 Two of the world's most beloved musical superstars, Paul Simon and Sting, kicked off the Australian leg of their On Stage Together Tour in fine form at the Brisbane Entertainment Centre last night. Strolling on stage in casual attire, the two legends got the crowd on their feet early asking everyone to "stand up" during opening number Brand New Day. They then launched straight into Simon's Boy in the Bubble and Sting's Fields of Gold. "This is turning into my favourite country," Simon told the crowd. 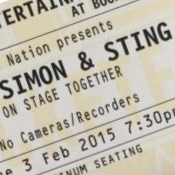 Sting, 63, and Simon, 10 years his senior, became friends when they were neighbours in New York in the late 1980s. After both being invited to perform a benefit gig in 2013, they were inspired to tour together. The tour was an experiment of merging bands, repertoires and voices, explained Simon. "We hope you enjoy it. We do." With no shortage of material to choose from, the pair took turns to showcase their most loved tunes including Police hits So Lonely, When the World is Running Down and Walking on the Moon, and Simon's Mother and Child Reunion, 50 Ways to Leave You Lover and Graceland. 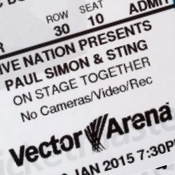 "I'm sure I'm not the only one for whom a Paul Simon song provides the soundtrack of one's life," Sting said, before launching into Simon and Garfunkel's America and following it up with a rousing Message in a Bottle that had the audience on its feet. The best concerts are the ones where the performers look like they are enjoying themselves, and that was the case here. It was great to hear two familiar voices singing lines from each other's songs, a match of talents and charming harmonies. The musical heavyweights surrounded themselves with top talent with 18 musicians on stage playing everything from cello to tuba. The Brisbane crowd of boomers and their offspring showed their appreciation, giving as good as they got, singing and clapping along. It's a once-in-a-lifetime tour, including, no less, for the gents onstage themselves. They'll follow their Australian shows at the end of the month with a European tour.